I posted a BYGL Alert last October on Porcelain-Berry (Ampelopsis glandulosa var. brevipedunculata) when the problem berries were fully ripened and available for widespread distribution by birds and other animals [see "Porcelain-Berry: The Next Kudzu?," October 6, 2017]. I'm revisiting this ever-expanding non-native vine because its invasive arc in southwest Ohio is being compared by some horticultural professionals as possibly rivaling kudzu (Pueraria montana var. lobata). 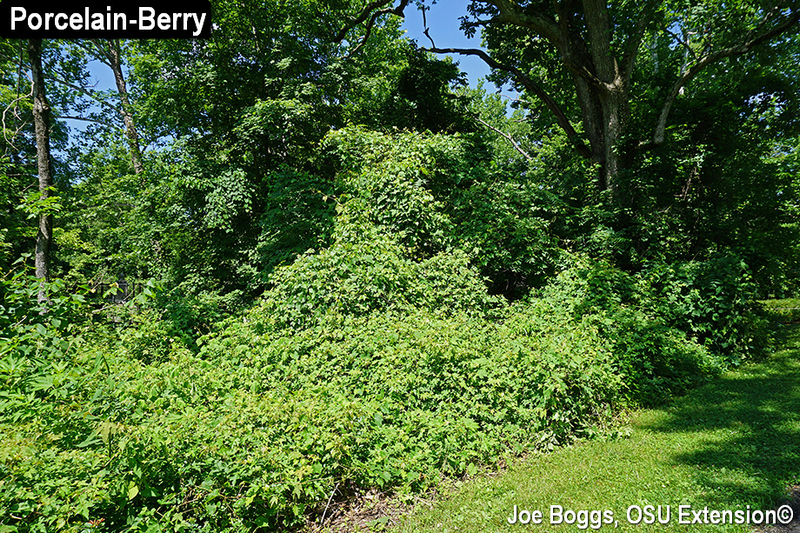 I first came across an "escaped" patch of porcelain-berry in 2014 while leading a BYGLive! Diagnostic Walk-About in a Hamilton County park. The small patch of this tangling vine was overtopping a non-native bush honeysuckle (Lonicera spp.) which was not a bad thing. The vine was not obvious elsewhere in the park. However, since that time, porcelain-berry has become widespread throughout that park where it commonly overtops shrubs and small trees. It's so dense in a number of locations that I've had audience members identify it as kudzu when I've shown pictures in my teaching presentations. This past Thursday, I came across small trees in a landscape several miles away so thoroughly covered with porcelain-berry it was hard to identify the trees; they looked like monstrous piles of vines. The trees are in a well-managed landscape in high-profile locations causing me to believe the over-topping occurred rapidly and recently. Otherwise, the porcelain-berry would have been removed. This illustrates the vigorous growth potential of this non-native and how quickly it can invade even the most guarded landscapes. Porcelain-berry belongs to the grape family, Vitaceae, and may be mistaken for wild grapes (Vitis spp.). In fact, both are commonly found growing together which I believe allows porcelain-berry to fly below our radar until it's unmasked by its name-sake berries. Even then the ruse may continue with "porcelain grape plant" being another common name you will find applied to porcelain-berry. However, the flowers and fruits of our native grapes are borne on long tapering panicles that hang down from the stem. Porcelain-berry plants bear their flowers and berries on upturned panicles with multiple points. The panicles point upward even on stems that droop downward. Porcelain-berry may also be mistaken for native members of the same genus such as heartleaf peppervine (Ampelopsis cordata) which is native to the southeast U.S. It doesn't help that "amur peppervine" is another common name for porcelain-berry. The leaves of porcelain-berry may also confuse the issue. Their shapes can vary widely; even on the same plant. Some leaves look very similar to wild grape while other leaves resemble mulberry (Morus spp.). Of course, the most distinguishing feature are the name-sake fruits. Porcelain-berry is a prolific seed producer. Although the flowers are small and inconspicuous, the lustrous multicolored speckled berries are very obvious and look like they were formed from porcelain. In fact, it's hard to ignore the colorful display of shiny berries cascading down drooping vines. Birds also find them attractive as a late season food item and they poop out vining offspring over a wide area. Porcelain-berry is native to northeast Asia including China, Korea, Japan, and Russia. Various sources in the literature notes the plant was first introduced into the U.S. in the 1870's as a landscape ornamental. Its vigorous growth habit and attractive berries have long made it a favorite in landscape designs. In fact, you can still buy plants and seed; just do a Google search using "porcelain berry plants." An eBay seller notes, "This plant is a vigorous grower that requires support. Good for fences, walls and arbors." Of course, they should add "good for entombing small trees." There's even a variegated form on the market, Ampelopsis brevipedunculata 'Elegans'. Here's a scary description from one online seller: "Vigorous grower by tendrils. Ideal for trellises or trailing over a retaining wall. Mature Height: 15-18 ft. Hardy to -30°F Maximum Elevation: 6,000 ft."
Thankfully, my web search revealed the number of sellers are far outnumbered by the number of postings warning of the highly invasive nature of porcelain-berry. The word is spreading, but perhaps not as fast as the vine. The best course of action is to not plant porcelain-vine! The second best action is to reduce the spread by acting quickly to pull-and-destroy young plants before they get a strong root-hold. Once established, porcelain-berry is difficult to control. There are no selective herbicides for porcelain-berry and its dense vining growth precludes the use of non-selective herbicides such as glyphosate (e.g. Roundup) unless the vines are pulled off of infested plants and then sprayed. Successfully hand-roguing established porcelain-berry plants is problematic due to the plant's vigorous root system. Trying to control porcelain-berry by ripping out vines usually results in more vines. However, spread by seed can be reduced by pruning and destroying vines before the berries ripen. There is still time to do this in southern Ohio. Most plants are still flowering and most berries have not yet ripened. I don't t know whether or not we're seeing "another kudzu" creeping over our landscapes. However, we shouldn't find out by doing nothing.